N-linked glycans are found attached to asparagine amino acids on many proteins produced by organisms. They are responsible for many structural and functional aspects of glycoproteins, including cell-cell interactions, intracellular trafficking, and affecting the solubility and stability of proteins in vivo. During protein synthesis, these glycans have also shown to affect protein folding and the intracellular transport within the cells. 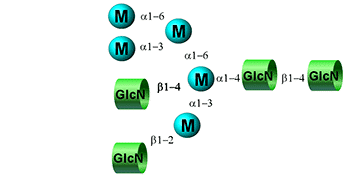 N-linked glycans are classified into three sub-types: high mannose, complex, and hybrid. All N-linked glycans consist of a conserved pentasaccharide core consisting of a linear chain of two N-Acetylglucosamine (GlcNAc) moieties attached to a mannose which branches out with two additional mannose residues. This is also referred to as the tri-mannosyl core. High mannose glycans consist of five to nine mannose sugars attached to the two GlcNAc (the chitobiose core) in a branched structure. High mannose glycans are found primarily in yeast and plants, though they are a precursor molecule for N-glycan synthesis within the Golgi and endoplasmic reticulum for most organisms. Complex glycans are characterized by having a conserved structure consisting of a branched structure with two to four arms linked to the two mannose sugars of the conserved core. Each arm consists of the following linear structure [-GlcNAc-Galactose-Sialic acid] when synthesized to completion, though post-translation modification may truncate the structures prematurely and/or sugar residues may be lost over the lifespan of the glycoprotein. Fucosylation of the asparagine-linked GlcNAc residue is common, as well as the presence of a bisecting GlcNAc attached to branching tri-Mannose-GlcNAc-GlcNAc core. 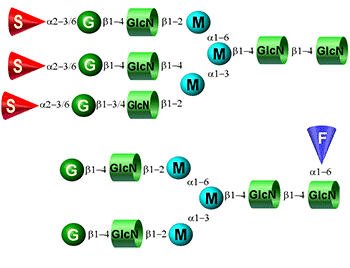 Hybrid glycans are characterized by have a combination of the two structures described above. One arm consists entirely of mannose sugars while the other contains the GlcNAc initiated arms found in complex glycans. Glycosylation is one of the most common post-translational modifications and has many effects within the living system. N-linked glycans are involved in both intracellular and cell-to-cell interactions. Being a common structural component of the cell wall, they often are found at the point of initiation of cell-cell interactions and contribute to many cellular response mechanisms. N-linked glycans are a major component of self/non-self recognition in vivo, contributing to many autoimmune disorders, organ rejection, viral entry into cells, and our immune response. N-glycosylation is also involved in the removal of proteins from circulation, as the degraded N-linked glycans presented on the outer portions of glycoproteins are recognized by the liver and eliminated. Todays biotherapeutic proteins often times contain n-linked glycans critical to the drugs function. Yeast derived proteins often contain high mannose glycans which are immunogenic in humans. Other glycoprotein therapeutics are produced in mammalian cell lines, such as CHO or NSO. Galctose-alpha(1,3)-galactose is common in other animals, but can cause a severe reaction in humans. The same is true for N-glycolylneuraminic acid (NGNA), common in non-human mammalian systems but immunogenic in humans. In addition to the immune repose issues listed above, the N-glycan profile can affect the half-life of therapeutic glycoproteins due to the liver function mentioned above. The complete capping of N-linked glycans by sialic acid allows the proteins to stay in circulation longer than those with truncated complex glycans.